Smooth shank nails are the most common and are often used for framing and general construction applications. They offer enough holding power for most everyday use. Ring shank nails offer superior holding power over smooth shank nails because the wood fills in the crevasse of the rings and also provide friction to help prevent the nail from backing out over time. 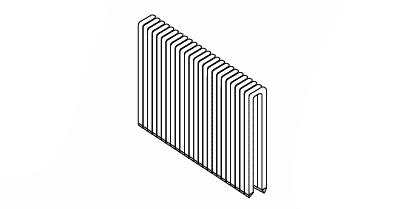 A ring shank nail is often used in softer types of wood where splitting is not an issue. A screw shank nail is generally used in hard woods to prevent the wood from splitting while the fastener is being driven. The fastener spins while being driven (like a screw) which creates a tight groove that makes the fastener less likely to back out. 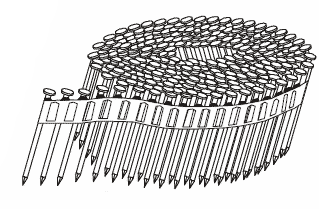 Annular thread is very similar to a ring shank except the rings are externally beveled which presses against the wood or sheet rock to prevent the fastener from backing out. A Cleat nail is generally used for hardwood flooring. Cleat nails have teeth that hold the fastener in place and prevent it from backing out in high traffic areas. A Type-A point is a very sharp point that aids in quick driving. This is one of the more common points you'll find when looking for screws. 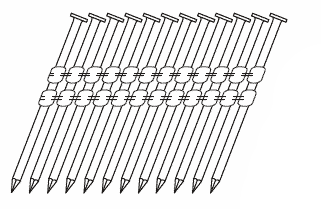 A Type-17 point is a fluted point screw that is designed to capture chips and debris while the screw is drilling. 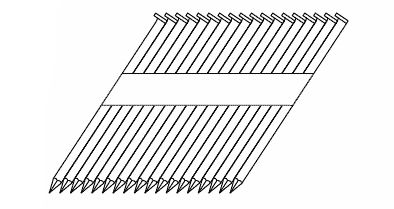 The fluted point also helps to reduce splitting by pre-cutting the wood while drilling. Paper tape is generally used for 30 through 34 degree framing nails and has a strip of paper with glue holding the fasteners together. Paper tape nails contribute to a cleaner job site because the paper around the fastener is driven into the wood along with the fastener, instead of around the job site. Paper tape also reduces the risk of having material stuck under the nail head leaving the top part of the fastener exposed. However, they are sometimes easy to break apart and do not work well in wet or moist conditions because the paper can become soggy. Plastic strip is generally used for 20 through 22 degree framing nails and 15 degree coil nails. They are held together by a strip of plastic that breaks apart when fired by a gun. They are often cheaper than other types of collated fasteners because they are easier to manufacture. However, they also leave a mess of plastic around the job site and can become very brittle when cold. They can also leave pieces of plastic under the head causing the nail to be exposed. Plastic band is generally used for 15 degree coil nails. Plastic band is a higher priced alternative to plastic strip but it eliminates the messy job site and also pieces of plastic stuck under the nail head when the nail is driven. The plastic band exit's the coil nailer in one piece making for easy cleanup. Wire weld is generally used for 28 degree framing nails and 15 degree coil nails. Wire welded fasteners use a thin piece of wire run lengthwise to hold the fasteners in position. They are not as susceptible to water or cold weather like paper or plastic collated nails, however, the can shoot sharp pieces of metal around the job site and are susceptible to having pieces of wire stuck under the head exposing the nail. Glue is generally used for staples and floor cleats. The glues only purpose is to hold the fasteners together while they are being driven. They offer no extra holding power after the fastener has been driven.